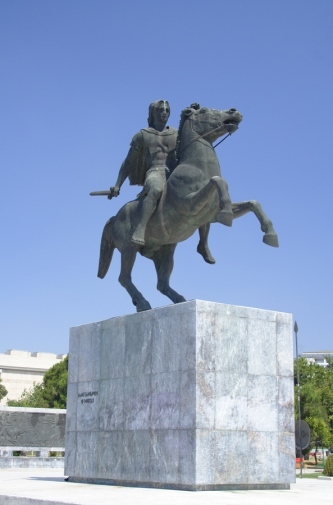 Greece is rightly proud of the King of Macedonia, Alexander the Great (356-323 BC), as the Greek Empire was at its mightiest during his reign. By the time of his death his armies had conquered lands throughout the Middle and Near East, as far as the Punjab, and down into Egypt, where he founded the city of Alexandria and where he is somewhere thought to be buried – although he actually died in Babylon. Alexander’s father, Philip II of Macedonia, was already extending his Empire and gave his son, who was born in Alexander the Great, the very best start in life. He had the finest teachers, including Aristotle, and he was commanding part of the Macedonian Army by the age of eighteen. Two years later his father Philip was assassinated as he prepared to invade Persia, and it cannot be certain that Alexander did not actually have a hand in this. Alexander immediately took command of the Macedonian troops, and in 334 BC took an army of some 35,000 of them across the Hellespont (now the Dardanelles) and although outnumbered they defeated the Persian Army allegedly with the loss of only 110 of their own men. He had already swiftly put down rebellions in some of the Greek city-states, notably Thebes, which he burned to the ground. From Persia he turned his attention to the Middle East, conquering Damascus, then Palestine, and finally marching into Egypt. Here he was welcomed for liberating the country from the Persians, and in 331 BC he founded Alexandria, having by this time complete control of the Eastern Mediterranean. Not satisfied with his, he headed for India, where he won more victories but at the cost of great numbers of men. Alexander the Great was back in Babylon in 323 BC, turning his attentions to conquering more of Arabia and further west into North Africa, when he was taken ill with a fever after a banquet and died eleven days later. His body was taken in a gold casket to Alexandria, but his burial place has never been firmly established. Some recent archaeological digs claim to have found his tomb in the Egyptian desert, but without convincing proof. 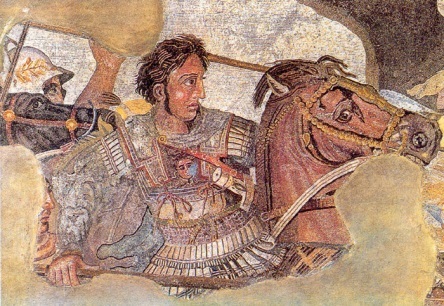 There is no doubt that Alexander was indeed one of the greatest leaders in history, noted for his tactical ability, his charisma in leading his men and inspiring bravery in his troops, and for his own bravery too. Like all such leaders, though, he had his ruthless side and didn’t hesitate to eliminate potential rivals just as swiftly and as brutally as he wiped out his enemies. It is also said that he had a vision not merely to conquer the world but to unite both East and West in one large harmonious Empire. Certainly the cities he founded were all civilised and cultured places, and he fervently spread Greek culture and language while taking an interest in the cultures of the lands he conquered. He might well even be regarded as the most important Greek who ever lived.